From left are Bethany Smith, Charlotte Rose Smith and her grandmother Joanne Smith. 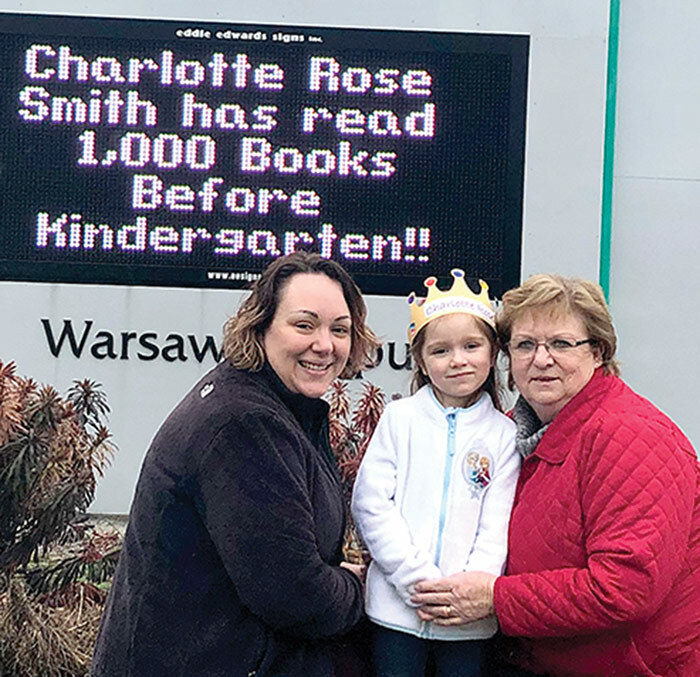 Charlotte Rose Smith, 4, is the first child at the Richmond County Public Library (RCPL) at the Rappahannock Community College (RCC) Warsaw campus to complete the library’s “1000 Books Before Kindergarten” program. Smith is the daughter of Bethany and Jonathan Smith of Urbanna. Bethany Smith teaches at the Chesapeake Bay Governor’s School at RCC. Every book read aloud to Charlotte Rose Smith or that she read herself was logged, reported RCC communications director Jeff Macharyas. The Bunny Kindergarten was number 1,000. RCL became an affiliate of the national 1000 Books Before Kindergarten program in 2017 and has enrolled some 121 children, said Macharyas. The program is designed to help parents and caregivers give their young children the confidence to become strong readers and successful in school and life. Upon achieving milestones, such as 100 books read, 200 books read, each child’s photo is added to the children’s room wall and posted on the RCPL Facebook page. Merchants such as Michelle’s Sweet Treats, T&J’s Dairy Barn, the Thomas Store, the Handy Store, Northern Neck Burger, The Daily and the Northern Neck Popcorn Bag have donated small prizes for each 100 books read.